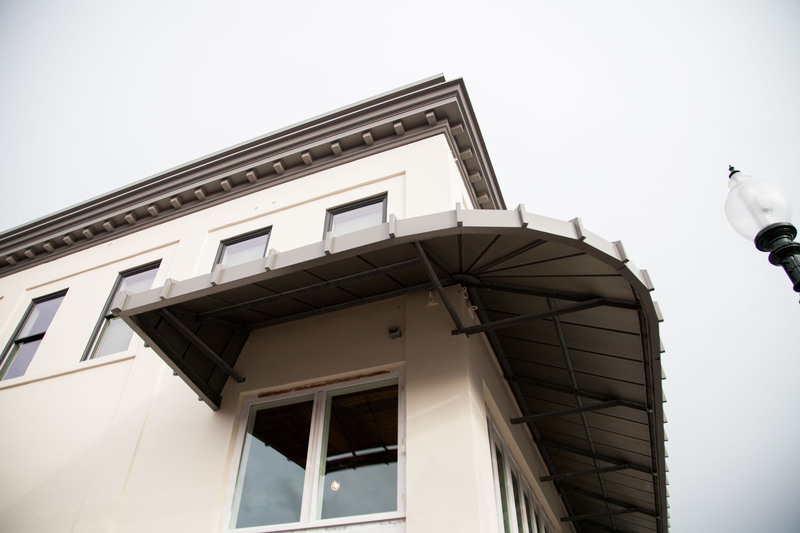 Home News Inn at Lynden: Opening Monday, Dec. 28th! While the full lobby won’t be quite complete for opening day next week, it is evident that it will be a handsome yet comfortable space for hotel guests and visitors alike. 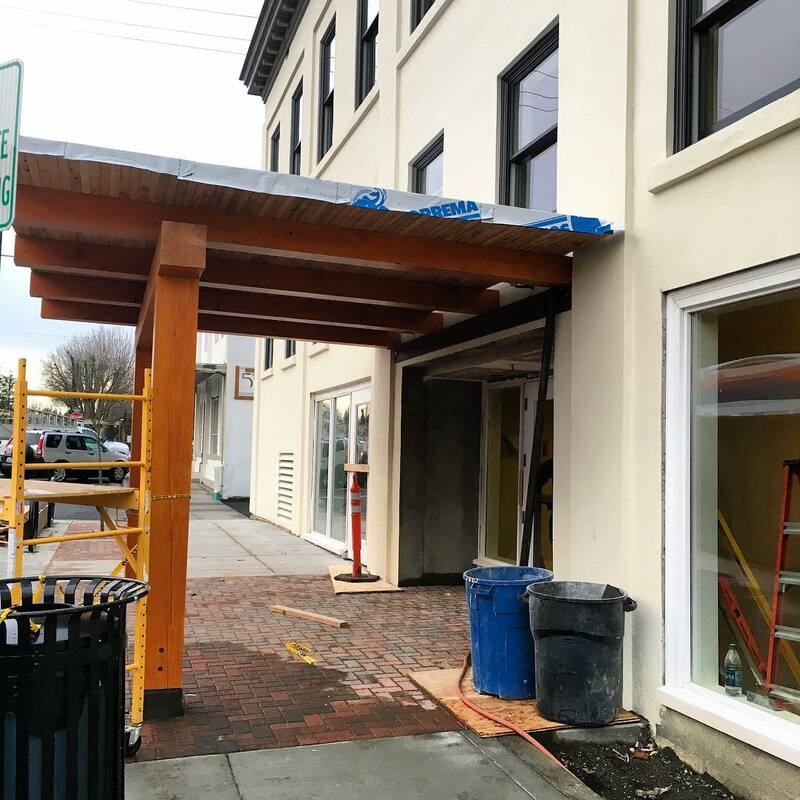 “We hope the lobby will become a popular meeting space in Lynden — you don’t need to be staying at the Inn to come enjoy the space!”, Teri said. 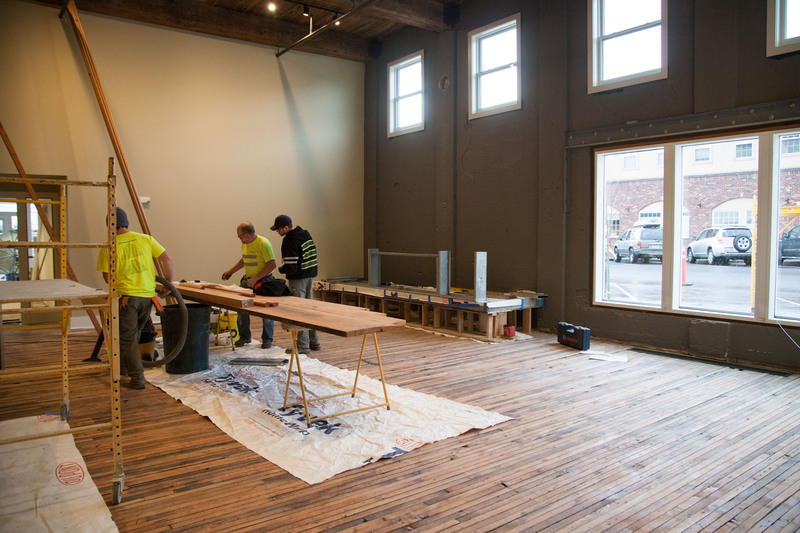 The lobby will feature an oversize stone and blackened steel fireplace, and connects directly to neighboring Village Books and to the yet-to-open Avenue Bread space on the corner. A newly-installed elevator just off the lobby provides access to the rooms above. 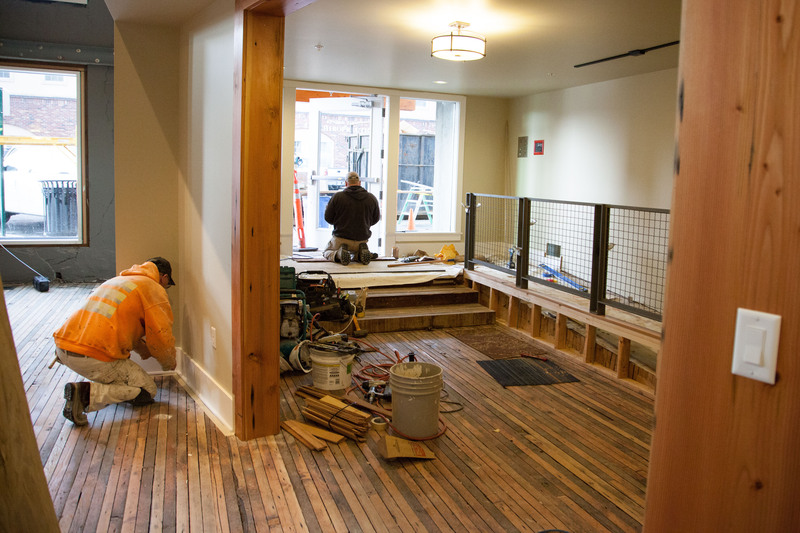 Similar to the Village Books space, the lobby’s floor is made of the building’s historic timber, side-to-side 2×6 boards, which show the character of their more than 100 years of service. All throughout the building and the Inn at Lynden, the developers used as much reclaimed wood and materials as possible. “We really wanted to honor the building and its history,” Teri shared. Lobby entrance interior off 5th Street, showing the historic wood flooring. 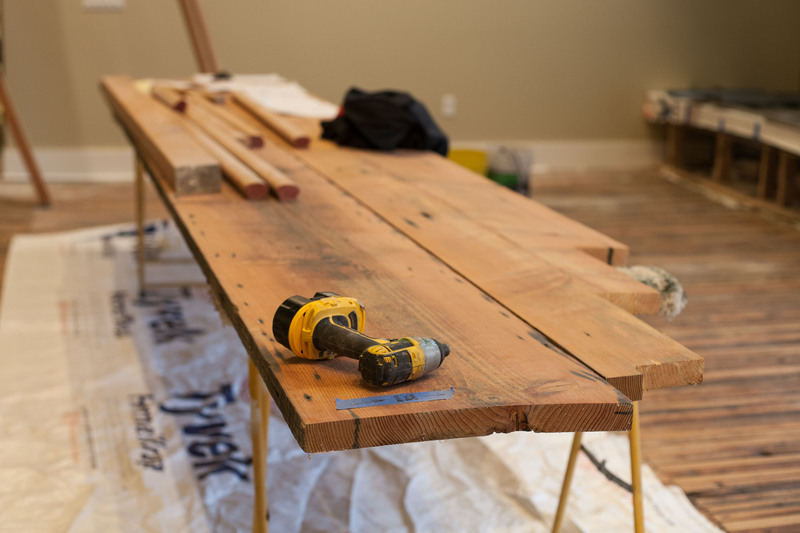 A power tool lays momentarily idle on a reclaimed wood piece awaiting installation in the Inn at Lynden lobby. With a wood-beam portico extending over the sidewalk, the lobby entrance is on Fifth Street (100 Fifth Street, to be exact). 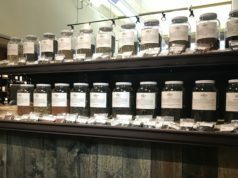 The lobby will be open year-round with a manager on duty 24 hours a day, and will offer guests water and coffee service from Lynden-based Woods Coffee, as well as a full range of Guest Services during daytime hours. Check-in starts at 3 pm, with checkout at 11 am. Until the lobby is complete, Guest Services will operate from the Waples Room on the mezzanine level, which serves as a meeting room for hotel guests, or for use by other local organizations. Going forward, use of the Waples Room will be free of charge to qualified non-profit organizations, and $100 for businesses, who can also order food and beverage service through the hotel’s neighboring tenants. The Waples Room overlooks Village Books and connects directly to Avenue Bread’s mezzanine level. 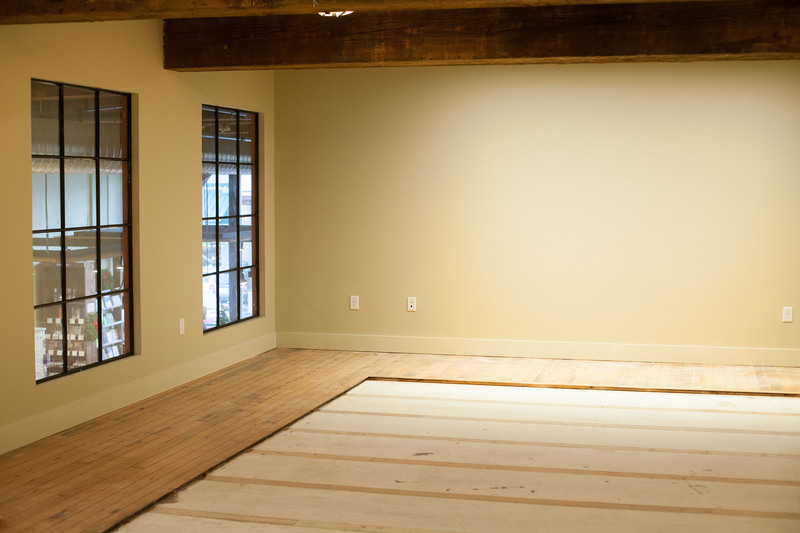 (A carpet inlay will soon fill the space surrounded by reclaimed wood in the picture). The Inn features 35 rooms, with nine cozy ‘Loft Rooms’ on the mezzanine level, and the remainder on the top floor. 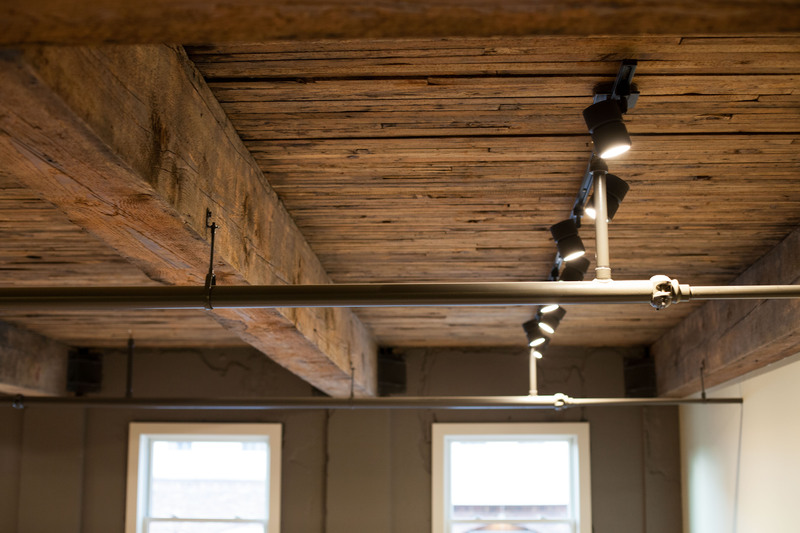 The Loft Rooms are the smaller of the bunch, with a cozier feel and basic hotel room amenities — but still feature the neat exposed historical elements of the building. One level up, the ‘Town Rooms’ along the perimeter of the building offer views of the life on the streets below, while the ‘Skywell Suites’ on the interior receive generous natural light from the skywell patio. The two ‘extended stay’ skywell rooms have exclusive access to the patio, offering guests the ability to step out for fresh air, or to sip coffee or wine on the patio’s bistro tables in the warmer months. Each room features its own Heat & Air Conditioning unit, and quality furnishings sourced through The Greenhouse in Bellingham. 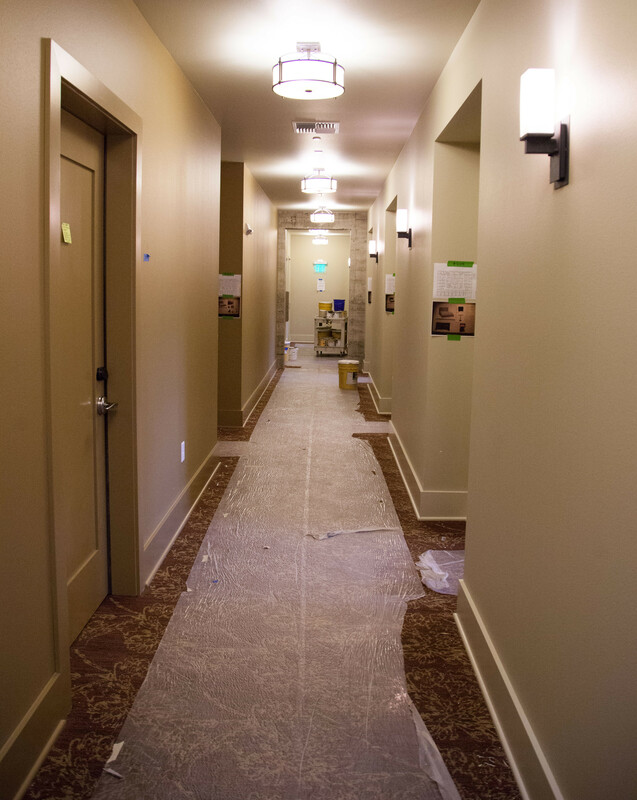 A hallway of rooms at the Inn at Lynden, with carpet protected during final construction. 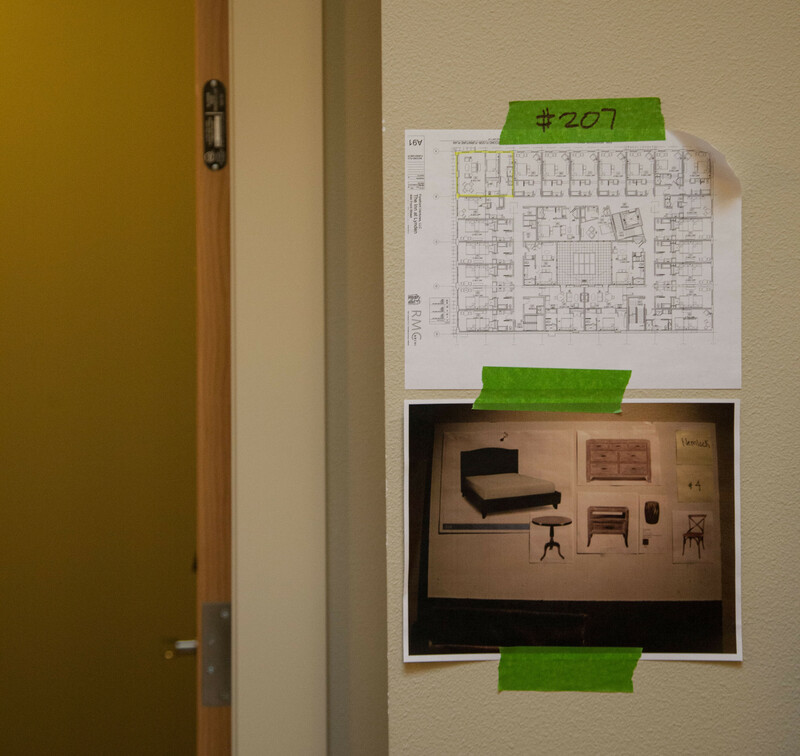 During construction, each room is marked with its hand-picked color and furnishings selection. 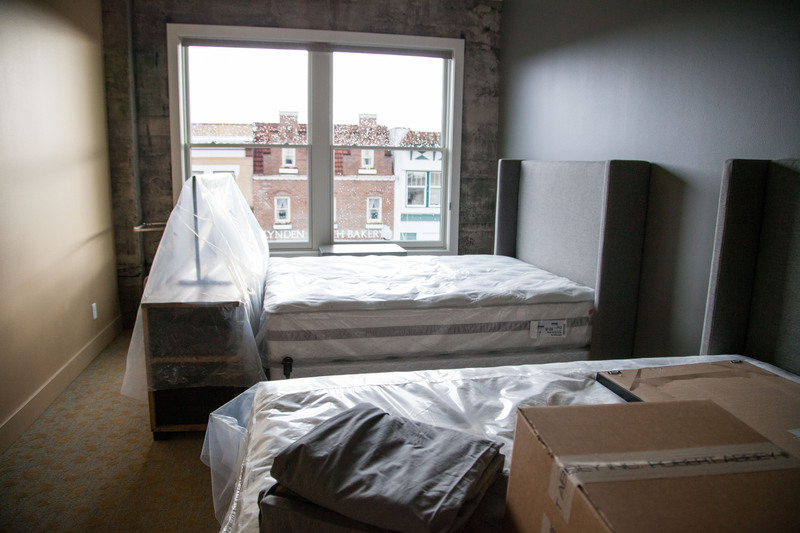 The more-basic Loft Rooms face the quieter alley-side of the building, but still feature the same quality furnishings and design as the others. Two rooms can be adjoined for groups staying together, and the Waples Room is available nearby. Exposed historic wood ceilings in a Loft Room of the Inn at Lynden. The Skywell Suites face the interior of the building, with large windows allowing plenty of natural light into the rooms. 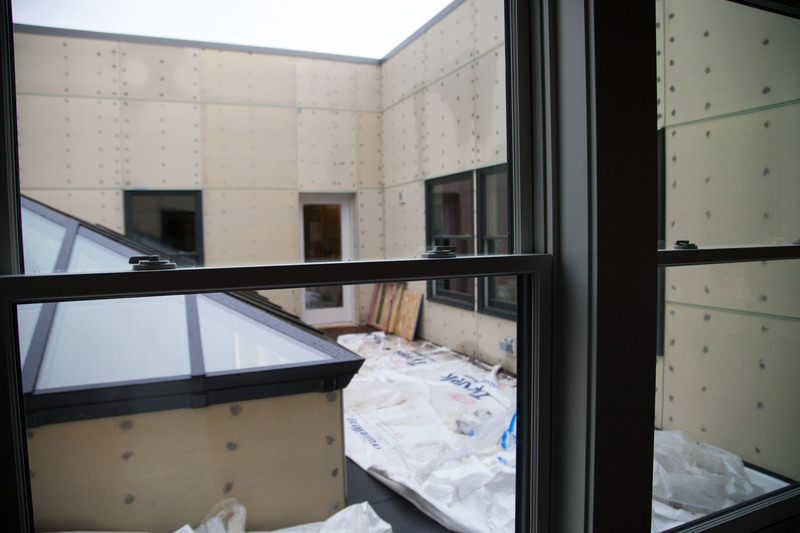 Inn at Lynden’s “skywell”, awaiting final touches, will feature a patio and allows natural light into adjacent rooms. The King and Queen extended stay Skywell rooms each have a fireplace, full kitchenette, mini bar, sleeper sofa, and access to the patio of the skywell, which is an open-air cutout on the top level. 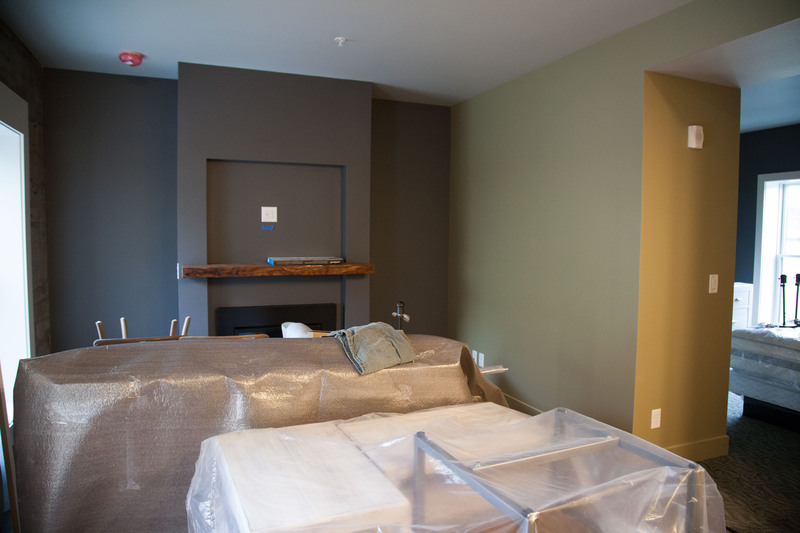 Extended stay Skywell room has its own fireplace, blocked by still-wrapped furnishings. The Town Rooms face either Front Street or Fifth Street, with Queen, two Queens or King beds. All rooms throughout the Inn feature deluxe mattresses, and local ‘Comphy Co.’ brand sheets. 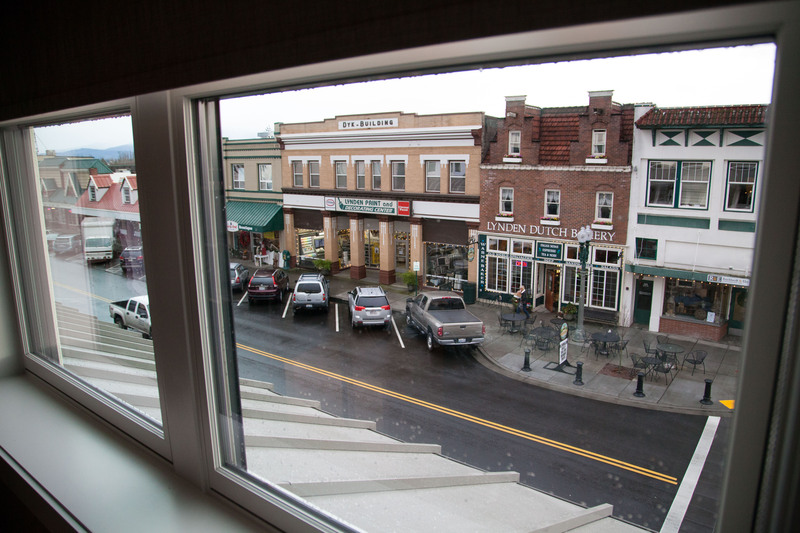 A Town Double Queen Room directly overlooks the Lynden Dutch Bakery on Front Street. 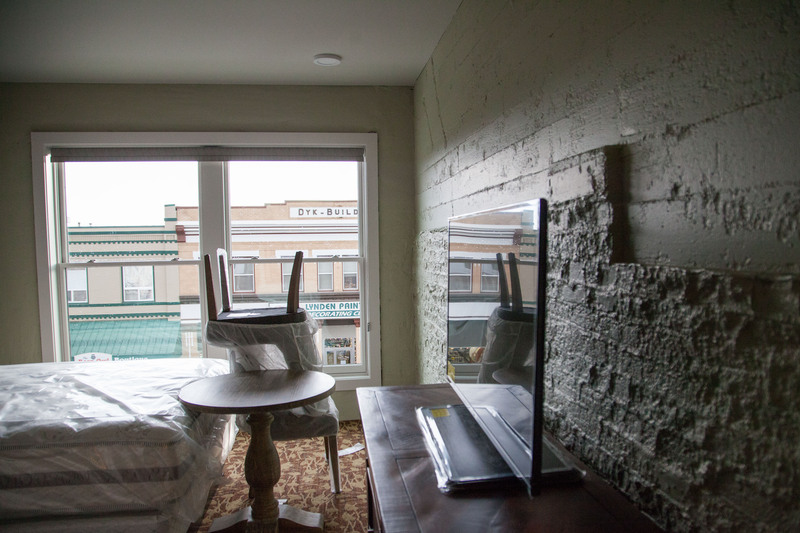 Town Room over Front Street, with historic exposed brick behind a modern flat TV, and still-wrapped furniture. 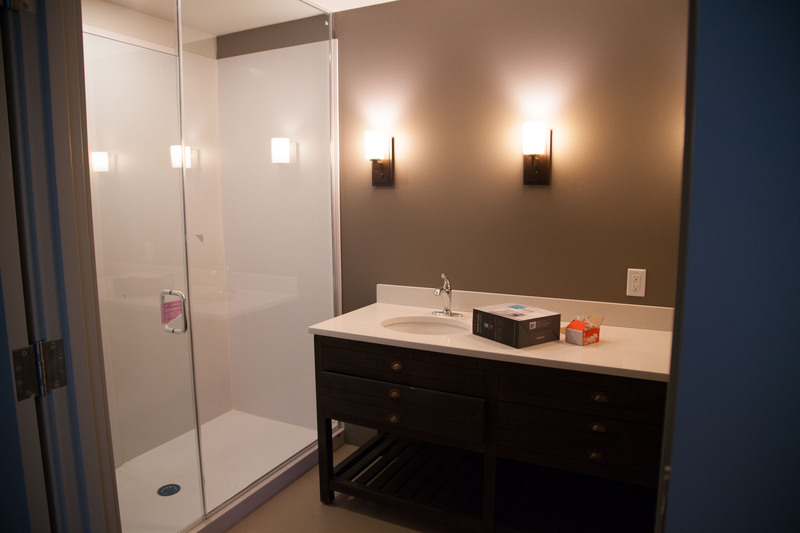 Quality bathroom fixtures include a walk-in shower in some rooms. Whether for a wedding party, anniversary celebration or just because, the Celebration Suite on the top floor corner of Fifth & Front takes the cake. It’s a very large room, with amazing views of the streets below (too bad there’s not a pulley system to the Lynden Dutch Bakery across the street!). The Celebration Suite features a King bed and accompanying sofa sleeper, a large closet, dining table for eight, walk-in shower and a hospitality bar. Celebration Suite of the Inn at Lynden — great views, comfy King bed and plenty of space to celebrate! Imagine this warm view in the Celebration Suite for the Lighted Christmas Parade… or any downtown event! 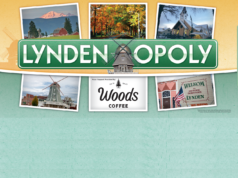 The Inn has entered into a 10-year parking agreement with the City of Lynden, Teri explained, which allows hotel guests to park in nearby city-owned lots. Employees will park either north of Grover Street or south of Front Street to avoid using limited nearby parking for downtown customers. While several rooms are already booked by Lyndenites wanting to check out the Inn on its opening night, the Inn will continue to offer a special discounted ‘Opening Rate’ through it’s website for at least the first month. Finishing touches will be put on the lobby, skywell and other areas to complete the design. 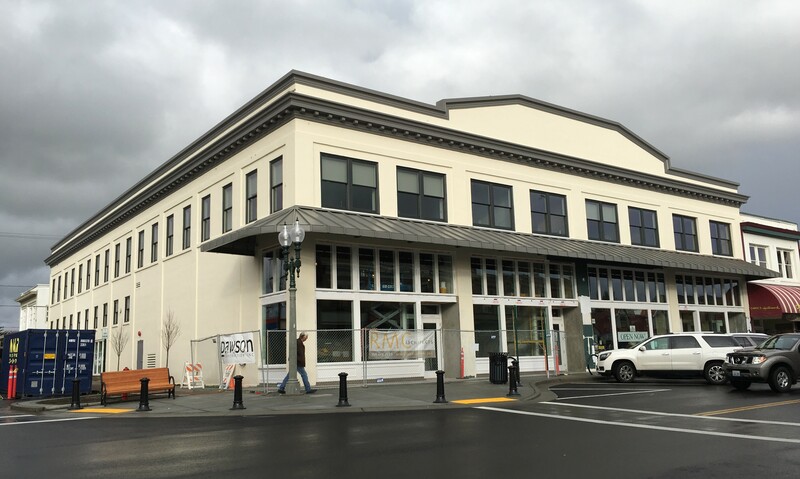 On the same day the Inn opens for business, the keys will be handed over to tenants Avenue Bread, Bellingham Baby Co., and Overflow Taps to make improvements to their spaces in preparation for opening (stay tuned for more details on ourLynden.com!). The Inn at Lynden will be hosting travel writers, and may partner with the Jansen Art Center for Art Events. 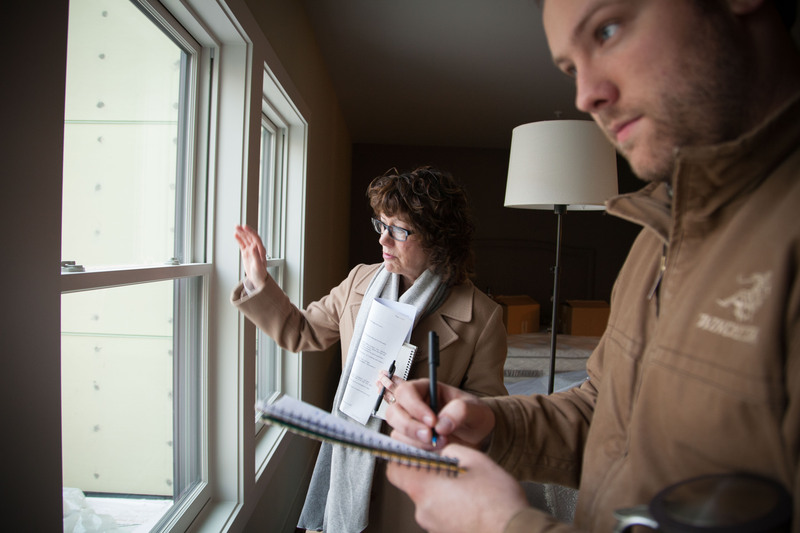 Teri Treat shares the details and vision of the Inn at Lynden with Joel VanderHoek of ourLynden. 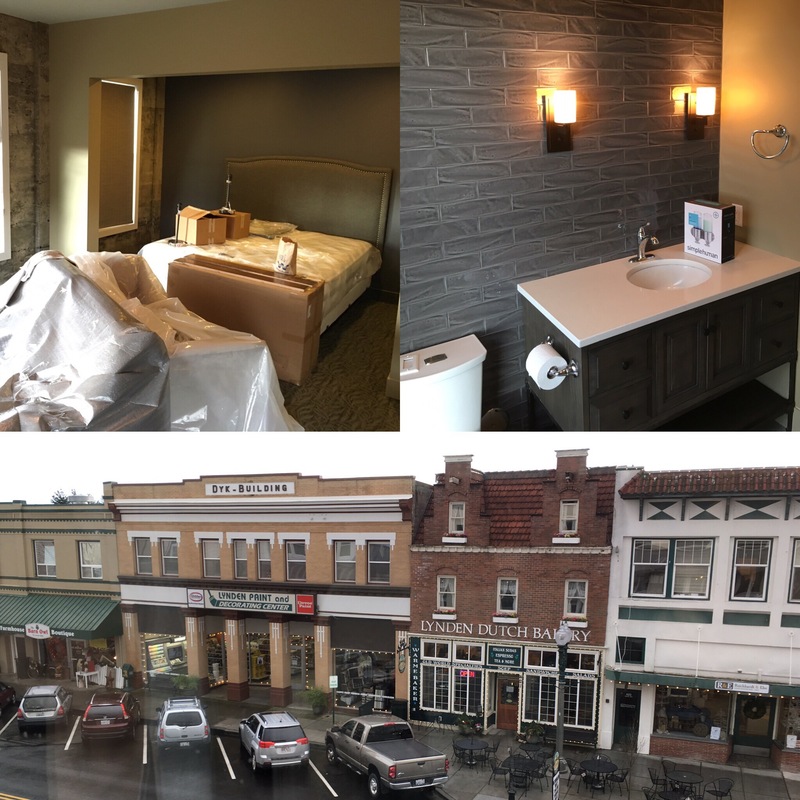 Whether you want to do a downtown Lynden staycation for yourself, or book for visiting family or friends, you can do so at www.innatlynden.com, by calling 360-746-8597, or drop by the Inn to speak to Guest Services and see it all for yourself! And of course: the bicycles! 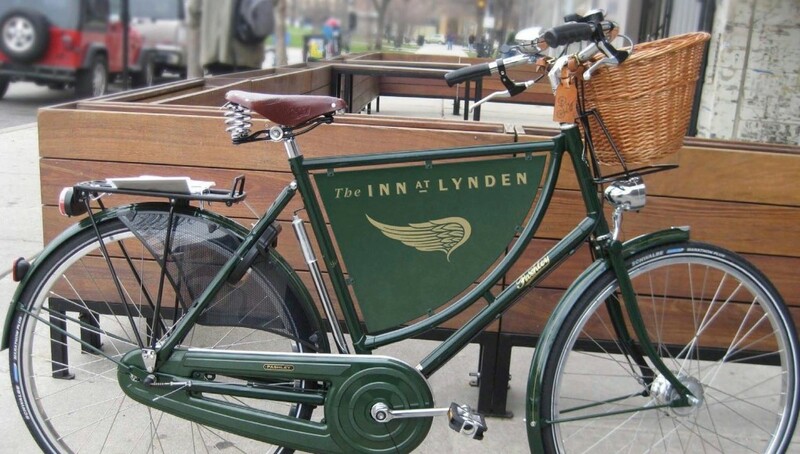 In many respects, the Inn at Lynden is a bicycle-themed hotel. Their very logo is Dutch bicycle. 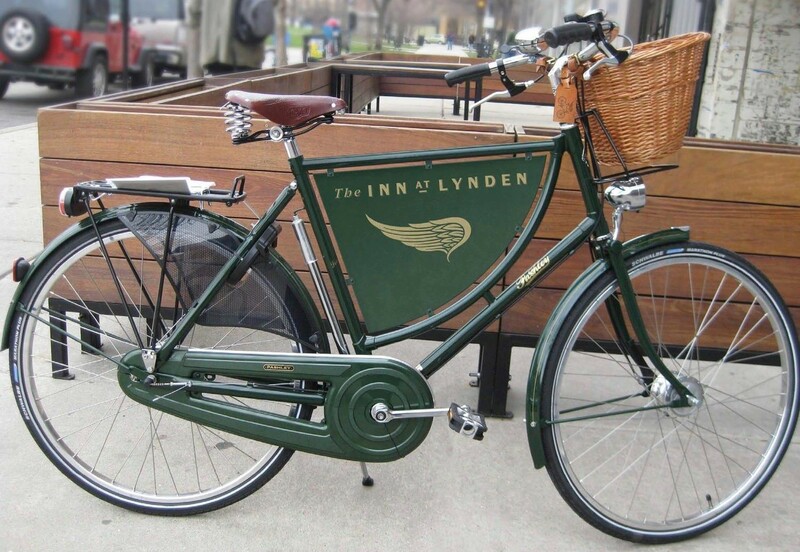 So, hotel guests will have access to complimentary bike rentals to ride around town — and those who bring their own bikes can utilize their ‘Bicycle Valet Service’. They hope to attract a bike shop to be on the premises, and Teri explained that they are in encouraging talks with an area bike shop about opening. Regardless, the Inn will be a great base for novice and amateur cyclists alike, and they’ve already installed bike tie-ups in front of the building. Photo Credit: Special thanks to my amazing wife Lindsey of HOEK Photography in Lynden for coming along to take some quick pictures during our whirlwind tour! Check out her page on Facebook here! Previous articleLynden in Lights 2015: don’t miss these neighborhoods and homes! Next articleSNOW in Lynden on Christmas Eve 2015!